Elkhart is pretty straight forward. Bikes are permitted on sidewalks except in a clearly defined area of downtown. See the above map. 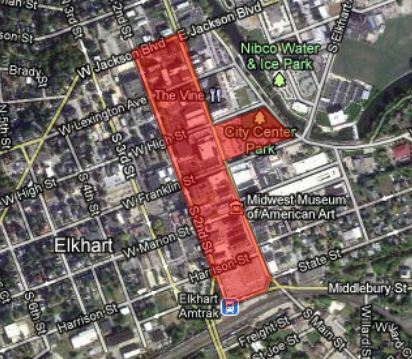 Interestingly, Elkhart just redefined the area: until last month, the restricted area was about three times the size of the current district. The old Elkhart district is above in blue. The new district is below in red. Mishawaka has the most restrictive ordinance: “No person shall ride a bicycle on the sidewalk or on any public right-of-way within the downtown business district, except in such places as are marked as bicycle paths.” The ordinance goes on to define the downtown business district. The definition is 403 words long and reads like a legal description. The district is shown below in green. In the opinion of most experienced cyclists, children belong on the sidewalk, but adults are better off in the roadway in most cases. The League of American Bicyclists points out that riding on the sidewalk is a significant cause of crashes: at every driveway and intersection bikers can surprise motorists who are simply not looking out for them. For sidewalk riders, the LAB recommends riding at walking speed and stopping or yielding at every intersection. This entry was posted on November 22, 2011 at 9:27 pm	and is filed under Commentary, Infrastructure. Tagged: accidents, Law. You can follow any responses to this entry through the RSS 2.0 feed. You can skip to the end and leave a response. Pinging is currently not allowed.